Back to work. Not much to report, so I thought I'd take a shot of something that has been cracking me up. 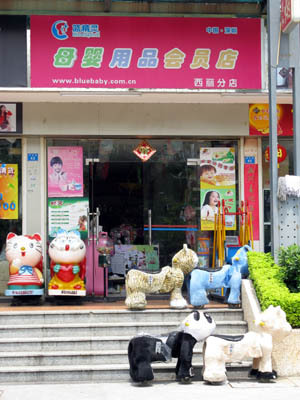 Take a look at this "baby goods" shop. Nothing unusual, right? You can just make out that, in the upper left, it says "Blue Spirit" next to the blue moon. But then look at the website address. I don't think they had an "English consultant" in on this, because there's something very unattractive about the idea of a "blue baby" isn't there?